Clothing/Jewelry Description A red shirt, blue jeans and red shoes. Quintana was last seen in Santa Fe, New Mexico August 8, 1987. She was at her home in the 300 block of Prince Road in the Rancho de Luna subdivision south of the city when her pager went off and she said she was going to use a pay phone on Cerrillos Road. She has never been heard from again. Her flatbed truck was later found at the De Vargas Center Mall. An unidentified person witnessed her getting into a red Jeep at the mall. Police have a suspect in Quintana's disappearance, a cocaine dealer who knew her. It was his pager she was carrying that went off the night of her disappearance. Quintana and the dealer were allegedly involved in a $5,000 cocaine transaction. Her husband said $6,000 went missing from the family's safe when she vanished. The dealer, when questioned, said Quintana did have cocaine debts. He denied having paged her and said he didn't know her whereabouts. The dealer and Quintana's husband were both imprisoned on drug charges in the years after her disappearance. 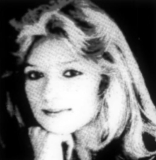 Quintana worked as a real estate agent at the time of her disappearance, selling condominiums that belonged to her father-in-law. Her case remains unsolved and foul play is suspected. Updated 3 times since October 12, 2004. Last updated July 1, 2017; height, weight and clothing/jewelry description added.